Word Mover's Distance is a promising new tool in machine learning that allows us to submit a query and return the most relevant documents. For example, in a blog post OpenTable use WMD on restaurant reviews. Using this approach, they are able to mine different aspects of the reviews. In part 2 of this tutorial, we show how you can use Gensim's WmdSimilarity to do something similar to what OpenTable did. In part 1 shows how you can compute the WMD distance between two documents using wmdistance. Part 1 is optional if you want use WmdSimilarity, but is also useful in it's own merit. First, however, we go through the basics of what WMD is. WMD is a method that allows us to assess the "distance" between two documents in a meaningful way, even when they have no words in common. It uses word2vec  vector embeddings of words. It been shown to outperform many of the state-of-the-art methods in k-nearest neighbors classification . WMD is illustrated below for two very similar sentences (illustration taken from Vlad Niculae's blog). The sentences have no words in common, but by matching the relevant words, WMD is able to accurately measure the (dis)similarity between the two sentences. The method also uses the bag-of-words representation of the documents (simply put, the word's frequencies in the documents), noted as $d$ in the figure below. The intution behind the method is that we find the minimum "traveling distance" between documents, in other words the most efficient way to "move" the distribution of document 1 to the distribution of document 2. This method was introduced in the article "From Word Embeddings To Document Distances" by Matt Kusner et al. (link to PDF). It is inspired by the "Earth Mover's Distance", and employs a solver of the "transportation problem". In this tutorial, we will learn how to use Gensim's WMD functionality, which consists of the wmdistance method for distance computation, and the WmdSimilarity class for corpus based similarity queries. If you use this software, please consider citing ,  and . You can download this iPython Notebook, and run it on your own computer, provided you have installed Gensim, PyEMD, NLTK, and downloaded the necessary data. The notebook was run on an Ubuntu machine with an Intel core i7-4770 CPU 3.40GHz (8 cores) and 32 GB memory. Running the entire notebook on this machine takes about 3 minutes. To use WMD, we need some word embeddings first of all. 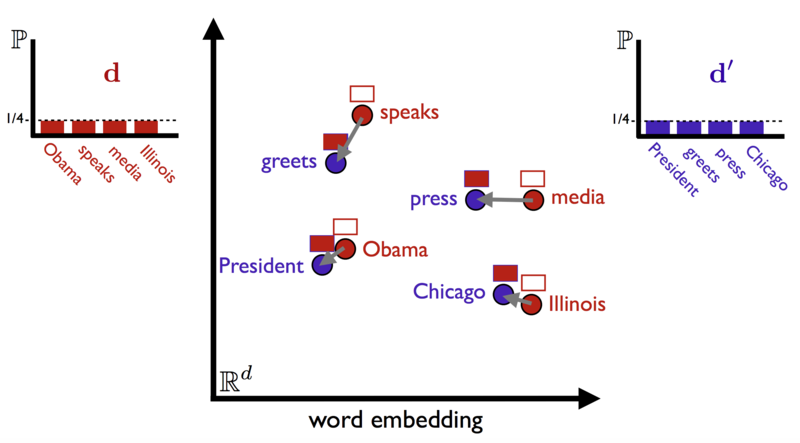 You could train a word2vec (see tutorial here) model on some corpus, but we will start by downloading some pre-trained word2vec embeddings. Download the GoogleNews-vectors-negative300.bin.gz embeddings here (warning: 1.5 GB, file is not needed for part 2). Training your own embeddings can be beneficial, but to simplify this tutorial, we will be using pre-trained embeddings at first. Let's take some sentences to compute the distance between. These sentences have very similar content, and as such the WMD should be low. Before we compute the WMD, we want to remove stopwords ("the", "to", etc. ), as these do not contribute a lot to the information in the sentences. # Import and download stopwords from NLTK. download('stopwords')  # Download stopwords list. [nltk_data]   Package stopwords is already up-to-date! Now, as mentioned earlier, we will be using some downloaded pre-trained embeddings. We load these into a Gensim Word2Vec model class. Note that the embeddings we have chosen here require a lot of memory. Cell took 259.69 seconds to run. So let's compute WMD using the wmdistance method. Let's try the same thing with two completely unrelated sentences. Notice that the distance is larger. When using the wmdistance method, it is beneficial to normalize the word2vec vectors first, so they all have equal length. To do this, simply call model.init_sims(replace=True) and Gensim will take care of that for you. Usually, one measures the distance between two word2vec vectors using the cosine distance (see cosine similarity), which measures the angle between vectors. WMD, on the other hand, uses the Euclidean distance. The Euclidean distance between two vectors might be large because their lengths differ, but the cosine distance is small because the angle between them is small; we can mitigate some of this by normalizing the vectors. Note that normalizing the vectors can take some time, especially if you have a large vocabulary and/or large vectors. Usage is illustrated in the example below. It just so happens that the vectors we have downloaded are already normalized, so it won't do any difference in this case. model.init_sims(replace=True)  # Normalizes the vectors in the word2vec class. distance = model.wmdistance(sentence_obama, sentence_president)  # Compute WMD as normal. Cell took 32.01 seconds to run. You can use WMD to get the most similar documents to a query, using the WmdSimilarity class. Its interface is similar to what is described in the Similarity Queries Gensim tutorial. WMD is a measure of distance. The similarities in WmdSimilarity are simply the negative distance. Be careful not to confuse distances and similarities. Two similar documents will have a high similarity score and a small distance; two very different documents will have low similarity score, and a large distance. Let's try similarity queries using some real world data. For that we'll be using Yelp reviews, available at http://www.yelp.com/dataset_challenge. Specifically, we will be using reviews of a single restaurant, namely the Mon Ami Gabi. To get the Yelp data, you need to register by name and email address. The data is 775 MB. The restaurants we chose were those with the highest number of reviews in the Yelp dataset. Incidentally, they all are on the Las Vegas Boulevard. The corpus we trained Word2Vec on has 18957 documents (reviews), and the corpus we used for WmdSimilarity has 4137 documents. Below a JSON file with Yelp reviews is read line by line, the text is extracted, tokenized, and stopwords and punctuation are removed. download('punkt')  # Download data for tokenizer. doc = doc.lower()  # Lower the text. doc = word_tokenize(doc)  # Split into words. doc = [w for w in doc if not w in stop_words]  # Remove stopwords. doc = [w for w in doc if w.isalpha()]  # Remove numbers and punctuation. # Business IDs of the restaurants. w2v_corpus =   # Documents to train word2vec on (all 6 restaurants). wmd_corpus =   # Documents to run queries against (only one restaurant). documents =   # wmd_corpus, with no pre-processing (so we can see the original documents). # Not one of the 6 restaurants. text = json_line['text']  # Extract text from JSON object. # Add to corpus for training Word2Vec. # Add to corpus for similarity queries. Cell took 114.53 seconds to run. Below is a plot with a histogram of document lengths and includes the average document length as well. Note that these are the pre-processed documents, meaning stopwords are removed, punctuation is removed, etc. Document lengths have a high impact on the running time of WMD, so when comparing running times with this experiment, the number of documents in query corpus (about 4000) and the length of the documents (about 62 words on average) should be taken into account. /home/lev/Dropbox/raretech/os/wmd/wmd_env/lib/python2.7/site-packages/matplotlib/__init__.py:872: UserWarning: axes.color_cycle is deprecated and replaced with axes.prop_cycle; please use the latter. Now we want to initialize the similarity class with a corpus and a word2vec model (which provides the embeddings and the wmdistance method itself). # Train Word2Vec on all the restaurants. The num_best parameter decides how many results the queries return. Now let's try making a query. The output is a list of indeces and similarities of documents in the corpus, sorted by similarity. Note that the output format is slightly different when num_best is None (i.e. not assigned). In this case, you get an array of similarities, corresponding to each of the documents in the corpus. The query below is taken directly from one of the reviews in the corpus. Let's see if there are other reviews that are similar to this one. sims = instance[query]  # A query is simply a "look-up" in the similarity class. Cell took 51.17 seconds to run. The query and the most similar documents, together with the similarities, are printed below. We see that the retrieved documents are discussing the same thing as the query, although using different words. The query talks about getting a seat "outdoor", while the results talk about sitting "outside", and one of them says the restaurant has a "nice view". # Print the query and the retrieved documents, together with their similarities. Very good, you should seat outdoor. It's a great place if you can sit outside in good weather. Patio is awesome but can get crowded. The steak was good. Prices reasonable for the strip and it was a great view with the outdoor seating. Best seat in the house with view of water fountain, good wine, good food n good service. Good value restaurant on strip! Great view take outside seat good food! However, be sure you make reservation! Let's try a different query, also taken directly from one of the reviews in the corpus. Reasonable prices. Makes for a nice dinner out in the town. Exceptional food at reasonable prices. Reservations are a must. Good food, great atmosphere, reasonable prices. Right in the middle of the Strip. Nothing not to like here. Incredible restaurant on the strip! Very reasonable prices, outstanding service, an breathtaking views. Bar none, my favorite meal on the Strip. don't let the tourist location throw you. terrific French food on the strip without the strip prices. Had lunch here, food price was very reasonable for vegas and the atmosphere was great. Nice place to take a date at a reasonable price. Really good food at decent prices (for being on the strip). Not a traditional steakhouse but just as good as many of them. Sitting out on the strip is very nice at nighttime. Great value on the strip and good quality food. Cell took 62.98 seconds to run. This time around, the results are more straight forward; the retrieved documents basically contain the same words as the query. WmdSimilarity normalizes the word embeddings by default (using init_sims(), as explained before), but you can overwrite this behaviour by calling WmdSimilarity with normalize_w2v_and_replace=False. Notebook took 181.05 seconds to run. Ofir Pele and Michael Werman, A linear time histogram metric for improved SIFT matching, 2008. Ofir Pele and Michael Werman, Fast and robust earth mover's distances, 2009. Matt Kusner et al. From Embeddings To Document Distances, 2015. Thomas Mikolov et al. Efficient Estimation of Word Representations in Vector Space, 2013.